I have been to adoption camp and I have overcome. It was actually delightful. I'll share what I learned later this week. Lesson #4: Don't turn your back on a kid with a stick. Especially if "baby got back." Now for some randomness related to spelling. 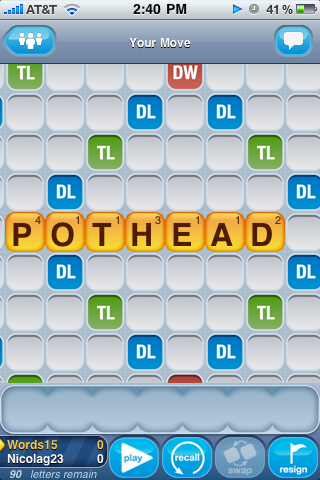 First, I love Words With Friends. My user name is "Words15." Come find me and we'll play indefinitely. I brought the heat yesterday with this mother of a game starter. Please ignore the fact I used a word of which I have no knowledge. Mom, I pinky swear. 61 points later and Nicolag23 was so over me. My friend Allison is thoughtful. In all the ways I am not thoughtful. She remembers your birthday and your favorite movie and what size you wear in everything. I'm lucky if I remember we met. Allison also buys you things. Things you don't hate or want to return. 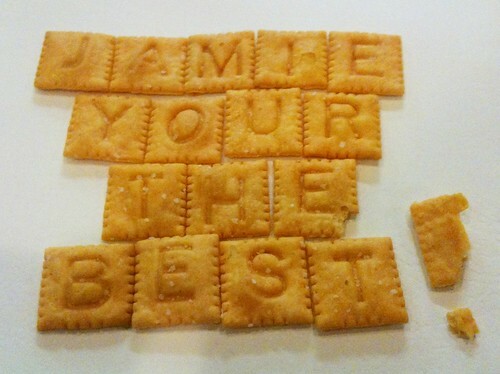 In honor of a long impending week of camp, she gifted me with my favorite Scrabble Cheez-its organized in an encouraging fashion. The intentional poor use of you're/your is gravy. I went and voted for you! I voted for you Jamie! !